Regular returners to the space (or people who know me IRL) will know that I'm really passionate about mental health and have been working on mine for the past few years. The combination of being catastrophic/ having unrelenting high standards/ whatever label various counsellors have given me to describe my thought patterns basically all contribute to a mind that isn't always pleasant. A few weeks ago, after crying all over my roommate because I didn't know why I felt so sad (when in theory my life was amazing), and following a particularly unhelpful Skype call, I realised some people just don't know what to do. Which is okay - I don't know what would make me feel better so I don't expect anyone else to, and I've definitely been in the position of wanting to help a loved one and feeling utterly lost over what to say. Then I read an email from a beloved aunt, who ended with the words "be kind to yourself" and it meant the world to me. I doubt that she knew my mind had been being extra mean that week, but it came at such an important time. It was a throwaway line at the end of a message, but to me it said: "I know what you struggle with, and I care". I have a friend who, when I'm feeling alienated and being distant, doesn't take offence when I detach but instead hugs me spontaneously. Often it can be just what I need to pull myself out of my own head, and I always feel more loved because of it. What works varies from person to person, but I'm found an incredible question to ask when you see someone struggling is simply: "can I do something to help?" or "is there something we can do that will help you feel better right now?". It's okay if the answer is no, the question itself shows them that you care. I also found some really helpful statements around depression and anxiety, these are not mine but I could really relate to some of them being useful and wanted to share them with you. + I don't fully understand what you're going through, but I'm here to support you anyway. + I'm not going to leave or abandon you. + I care about you. + Would you like to talk about what you're going through? + Take it one day at a time, and I'll be here with you through them all. - Why aren't you happy when you have such a great life? + I'm sorry that you're going through that. That sounds scary. + Try to take some slow, deep breaths. + Is there something we can do together that's relaxing for you? + It's okay, you're not freaking me out. + This is not your fault. - Just calm down, you're overreacting. - Come on, What is the worst thing that could happen? - Be rational: That would never happen. - It's all in your head, just stop thinking those thoughts. 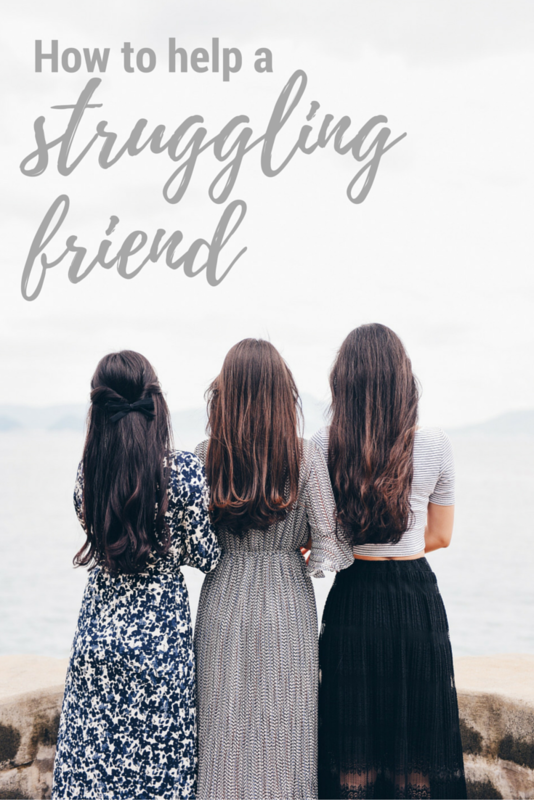 It's not always easy to be a friend to someone whose struggling – as one friend who was in a particularly bad place once remarked to me "depressed people are so boring". But having been on both sides, I know how much better it is when a supportive friend is empowered with skills and awareness. You often can't fix it for them, but you can be there and that makes a huge difference. This is such, such a helpful post. I'm good with words but struggle big time when it comes to comforting friends who are struggling like this. Liza, every day I love your blog more and more and I'm starting to think that we are very much alike.. Thank you for this wonderful post! (Your blog review is coming, promise! I didn't forget! I've just been so crazy busy working 6/7 ..) Keep up the good work!